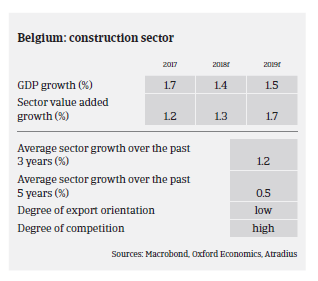 The overall indebtedness of many Belgian construction businesses is still high, while banks remain rather unwilling to provide credit to the industry. With well-filled order books, the current demand situation is generally good in the Belgian construction sector. Despite significant competition, sales prices have increased, although not yet to pre-crisis levels. Profit margins however, remain very low, except for in some niche markets. 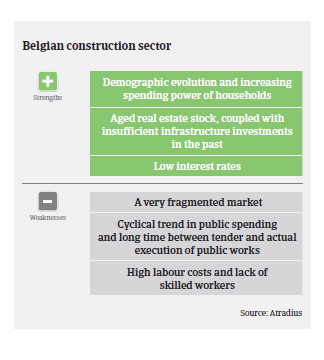 This is also because, compared to neighbouring countries, the Belgian construction sector is highly fragmented, and consolidation is ongoing. In order to remain profitable, companies need sufficient financial resources to invest in real estate development projects or expensive tendering. Working capital requirements for more lucrative projects have been increasing, as customers are shifting full responsibility and financing needs to the contractor (Design, Build, Finance, and Maintain projects). At the same time, hiring suitable experienced staff remains an issue, and labour costs are high. Delays in the start-up of projects are common, while contractors need to respond swiftly once an order is placed, which reduces time to prepare work. In the private sector customers tend to split building projects into parts, which increases tendering costs. The final settlement of projects can take a very long time as well. While construction projects are getting more complicated (e.g. stricter energy efficiency regulations, more complicated administrative procedures), digitalisation (Building information Model, 3D printing) is expected to improve efficiency and productivity in the future. Smaller companies not able to cope with the new technologies will probably become less competitive with larger players. Residential construction and real estate development are supported by low interest rates and higher incomes. However, growth is hampered by more difficult and slower approval procedures of building permits since this task has become a local responsibility. At the same time, high energy efficiency requirements make building processes more expensive. In some areas (e.g. Antwerp) there is a potential risk of the market overheating due to oversupply of new (overpriced) buildings. Current building activities still show a clear preference for flats/apartments at the expense of single-family houses. Since 2007, the number of renovation permits granted has been higher than the number of new residential building permits granted. However, this trend has changed since Q2 of 2018. In the commercial construction segment margins are low due to market saturation. Many construction businesses that made large investments in the past must increase turnover to cover fixed costs. Many of these organisations, however, are not adjusted to this. Additionally the fast growth of e-commerce negatively affects construction investments of the retail sector. Businesses related to public construction currently still benefit from projects related to elections (municipal in 2018 and regional in 2019) even though the effect is less pronounced than in previous years. Several large infrastructure works (Oosterweel, sluis Terneuzen,) have taken capacity out of the market, resulting in higher working volumes for businesses as a whole. However, capacity issues sometimes result in decreased efficiencies and margins, and many companies complain that margins are generally too low in the public tendering market. Public construction investment volumes (especially in infrastructure works) is still low, compared to neighbouring countries. However, in September 2018 the government announced it will increase investments in the future. The overall indebtedness of construction businesses and their dependence on external financing is still high, while banks remain rather unwilling to provide credit to the construction sector. At the same time many construction companies are still confronted with defaulting payers (high DSO), and few Belgian companies are able to get advance payments. In general, payment terms tend to be long in the sector, i.e. “60 days end of month” is very common. Payment experience has been bad over the past two years, and the number of non-payment notifications in the sector was high in 2018, with no major improvement expected in 2019. Construction insolvencies increased by more than 2% in 2018, while for Belgian businesses as whole the trend was positive (down 1%). 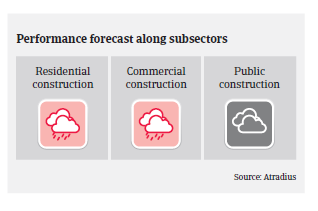 In 2019, construction insolvencies are expected to level off. Due to the issues mentioned above our current underwriting stance is neutral to restrictive for all subsectors. In order to sustain our risk appetite, it is necessary to identify the most affected companies/subsectors and to contact buyers for up-to-date financial information and performance outlooks. We examine the flexibility of companies (fixed cost structure) and whether they are able to build a buffer against potential economic downturns.